Reading comprehension is the very essence of reading. It is more than the words on the page. It is being able to interpret what the author says. Don’t worry it is not that hard in a homeschool setting. Read further to see how easy it is. There are three stages of reading comprehension. The first stage has to do with understanding that letters stand for words and the words have meaning. When a child is first learning to read we spend a lot of time teaching the sounds of the letters in our language. We teach phonics. We can also use pictures to show our child what the words mean. Here is a picture I made in Open Office. The center letters use the symbol font. I typed the words “can you read this”. After a child learns to read we continue to introduce new words to him. We need to increase his spoken vocabulary so that he can read more advanced books. We also need to make sure that he knows the meaning of words that he is reading. In the second stage our child needs to know how to classify. We start teaching classification with sorting real items. Then when he is older he can learn how to classify ideas. This stage also has to deal with sequencing. Our child needs to know the beginning, middle, and end of the story. He should be able to predict what will happen next. The third stage of reading comprehension is literary analysis. During this stage that child can identify the plot, setting, theme, and the author's point of view. He should also be able to talk about different literary genres. He will learn about figurative language. It takes about six years for a child to go through the stages. As your child grows he will understand more from his reading. One stage is never completely finished. Your child will always be learning new vocabulary. He will be able to reason better and will learn more about literary form. Above I have mentioned about the importance of vocabulary. We can help our child develop the meaning of words by taking him places. When he is young go to the store, park, zoo, etc. and take about what you are seeing. By going places and talking about what you are doing you are helping your child develop background knowledge. Then read lots of books especially picture books. Show your child the words and pictures. Teach him to read using picture books. When he is reading fluently ask him why he is reading a book. Is the book for fun or information? We read books for information differently. Teach him how to find the main idea and supporting facts. One way to read a nonfiction book is to do a K (know) W (want to know) and L (learned) chart. We can help our child by asking what they already know about a subject. Then think of some questions that the book might answer. While your child is reading the book have him list some facts that he has found. Another idea is to use graphic organizers. Or your child can outline the information. When you are analyzing a story use a story map. On a piece of paper list the main characters. List the problems that the characters face. Also note the setting and plot. Write what the conflict is in the story. Young children can sequence a story. Have them tell you what happened in the beginning, middle, and end. 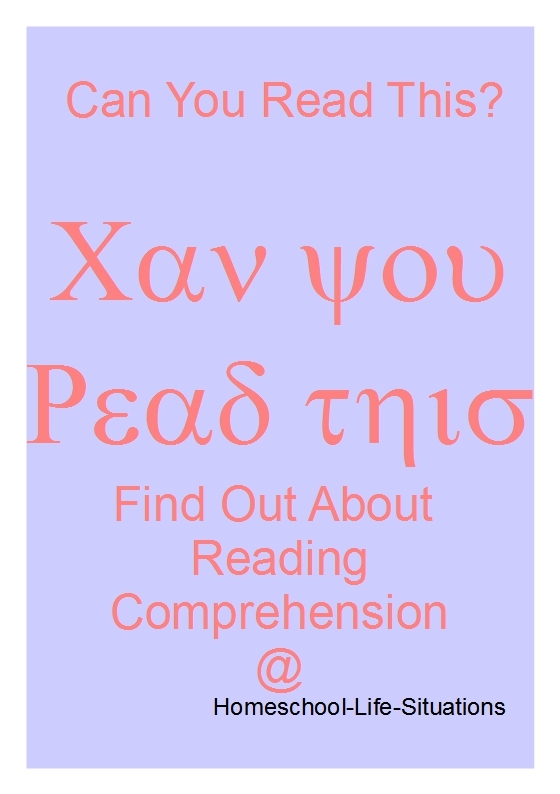 You can make you own reading comprehension worksheet. You will need to be familiar with the story that your child is reading so that you can write some questions. You will also need to know at what stage your child is in so that you can write appropriate questions. Some of the easiest questions for your child to answer are true false. Multiple choice is also easy for children to do. Fill in the blank is easy for most children. Short answer and essay questions are the hardest for children to do. Essays require more thought than simply choosing the right answer from a multiple choice question. Beginning readers can do true false question. They can also answer questions about whom or what the story was about. Later a child will be able to answer questions about who did something or what happened. Next your child will be able to answer where questions. In later grades he will be able to answer why and how. He will also be able to answer questions about literary form. We should also ask about the meaning of any new vocabulary words. When we make our own worksheets we can use any story that we want. We can make worksheets for Bible stories, novels, and informational articles. Here are some examples of questions that you can ask your child. The questions come from Charlotte's Web. True or False, The animals on the farm could talk. Fill in the blank. Charlotte was a ___________? How did Charlotte save Wilber? You can help your child through the stages of reading comprehension.